This exhibition features National Treasures gathered from across various periods and genres under the theme of the “form of prayers,”─tangible objects that people have placed their hopes in and cherished wholeheartedly. A considerable attempt is being made through these National Treasures to re-evaluate the essence of the formation of Japanese culture, as seen in the “form of prayers.” Works on exhibit are all National Treasures. This truly is an exhibition that highlights the heart of Japanese culture. * Objects will be rotated during the course of the exhibition period. Objects for which “on exhibit” dates are not specified will be on display for the full term of the exhibition. This section presents the essence of Buddhist culture from the Asuka and Nara periods, when the encounter with Buddhism brought about a rapid deepening of spirituality, and the Heian period, when aesthetics reached maturity. A masterpiece of raigo (“heavenly descent”) painting depicting Amida Nyorai and his attendant deities descending on a bank of clouds from the Pure Land. This section introduces archaeological artifacts, arms and armor, and Shinto idols produced in the context of worship. 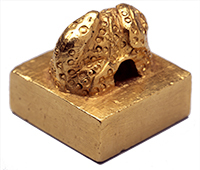 The preeminent modeling of these National Treasures reveals the profound devotion to a wide variety of deities that persisted through successive periods. All five dogu earthenware figurines below designated as National Treasures will grace the galleries between November 21 and December 7. With no facial expression and a body that is deformed to the extreme, this figure offers an impression of elegant refinement. 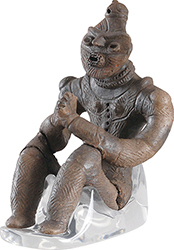 Hollowed out on the inside, this figurine embodies the superlative technical skill of the Jomon people. 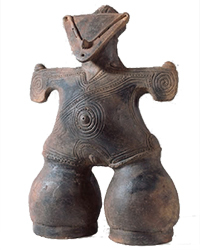 This female deity figure appears to wear an inverted triangular mask. Sense the emotion emanating from behind the mask. What does it see before it, this figure sitting with knees bent, gazing out over its hands clasped in front of its breast? In contrast to the noble facial features, the softly swelling curvaceous beauty of the belly and buttocks of the figure convey a sense of maternity. This section presents aspects of faith and prayer directly and indirectly through the various literary and documentary work of National Treasures. This seal is engraved with the most famous five-character inscription in the history of ancient Japan: “Kan (no) Wa (no) Na (no) Koku-o” (King of the state of Na in Wa under the Han dynasty). An illustrated scroll depicting the tale of Yowa no nezame (Awakening at Midnight). 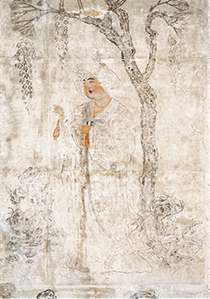 In it, the world of courtly literature with its descriptions of Buddhist devotion, romantic love, and familial affection unfold through graceful pictures and calligraphy. 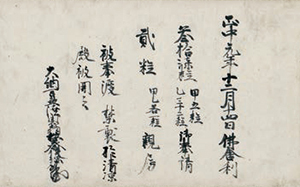 This is a receipt issued for the distribution of Toji reliquary contents to Emperor Godaigo and Kitabatake Chikafusa. 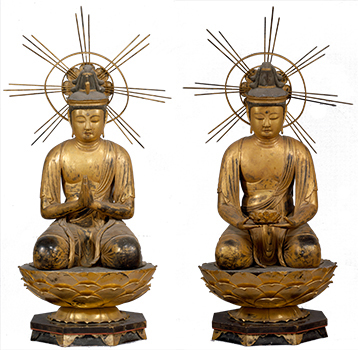 This section provides an overview of the shape and legacy of Japanese faith from the Kamakura period onward, as it achieved various complex and multifaceted developments. This painting was produced to adorn the walls of Shounji, built by Toyotomi Hideyoshi in memory of his beloved son Tsurumatsu. 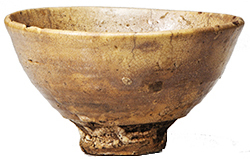 Ido-type bowls made in Korea were highly prized in Japan for use in the tea ceremony. This piece represents the pinnacle of these wares. 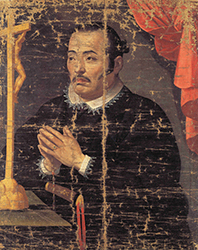 The subject is depicted as a Christian devotee with rosary beads and a cross clasped in his hands. It is an oil painting that was painted in Europe. 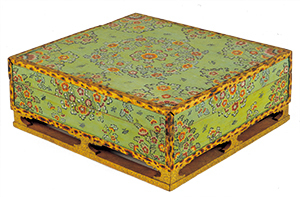 Yellow was the royal color of the ruling family Sho of Ryukyu kingdom. 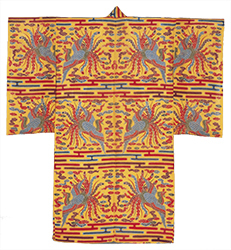 The designs of phoenixes and auspicious clouds along with other motifs are dyed in vibrant colors. 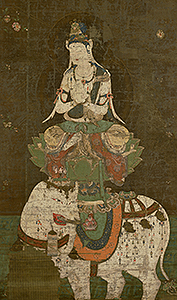 In the mid-6th century, King Seong of Baekje sent a Buddhist sculpture with sutra texts to Japan as gifts, marking the first formal transmission of Buddhism to Japan. From that time on, Buddha images were produced continuously throughout each successive era. 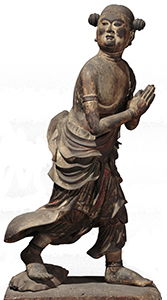 This section features eight important Buddhist sculptures designated as National Treasures. 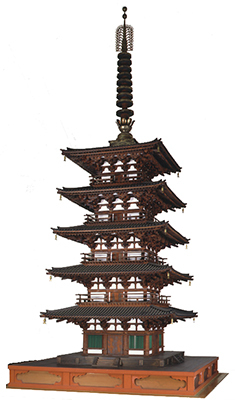 A Nara-period pagoda built with genuine construction methods of an actual building at a height of 5.5 meters. It is the only structural National Treasure in the exhibition. Numerous treasures offered up with the deepest devotion to the Great Buddha of Todaiji have been carefully safeguarded and preserved through the Shōsōin Repository. For a limited time during the exhibition, eleven celebrated gems from this collection will be on view, presenting a glimpse of the quintessential Nara-period modeling style and techniques of the 8th century. * Advance tickets will be on sale at the museum ticket booths (during museum opening hours excluding the last 30 minutes), Lawson Ticket (L-code: 32200), e-Ticket Pia (P-code: 776-176), Seven Ticket (Seven code: 030-612), E-Plus, and other major ticketing agencies from Wednesday, July 9 to Tuesday, October 14, 2014. Organizers Tokyo National Museum, The Yomiuri Shimbun, NHK, NHK Promotions Inc.
With the Sponsorship of SOMPO JAPAN NIPPONKOA INSURANCE INC., Daishinsha Inc., Nippon Express Co., Ltd., Mizuho Bank, Ltd.